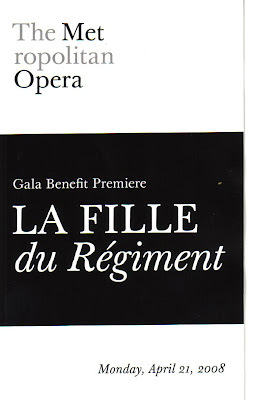 Last night's opening night of La Fille du Régiment was a blow out night. It truly is one of the best and most entertaining productions I've seen in any theatre. That is in part attributed to Donizetti's great music and the updated and enhanced text by a great team, but it was mostly due to Natalie Dessay's brilliant comedic performance. Her voice was glorious last night - pianissimos were delicate and top notes were thrilling. Juan Diego Florez did his best too, hitting his all of his money notes, bowing and clutching his heart to the ridiculously appreciative audience and then doing an encore, for a total of 18 high c's! That was the first time I had seen an encore at the Met and okay, I admit, it was thrilling. The supporting cast was absolutely fabulous. Felicity Palmer, Alessandro Corbelli, the entire men's chorus, Donald Maxwell, and Marian Seldes, in her Met debutwere just a riot. It's almost astonishing to see these singers moving so much on stage while singing unbelievably - it's acrobatic and thrilling. It was a gala premiere evening and there were a load of young celebrities in attendance. I really have no idea who most of them are, except I did recognize Joshua Jackson right away. He wore no tie, but oh, he's cute. 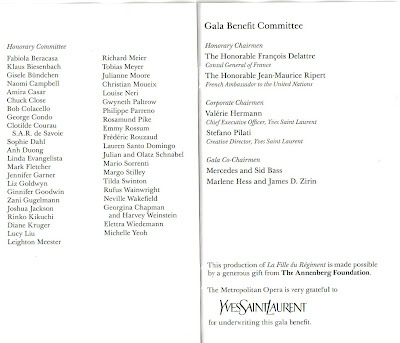 Some of these were on the Honorary Committee for the evening. Don't ask me why, but I guess the Met is still attempting to grow young celebrity support. A few recognizable to us who we did see during the intermission dessert on the Grand Tier, but who didn't make the white carpet shots, were Broadway/Cabaret Diva Barbara Cook, Mezzo Diva Susan Graham and Philanthropist Diva Mercedes Bass. I'd rather see these divas anyday. Although most were attending the opening night party, it was quite a scene backstage as well. The new Mrs. Florez hurried past us while we were waiting in line to see Miss Seldes. In the dressing room area, we saw Mercedes Bass up close for the first time and wow, she's everything you want her to be. She fairly floated by us. We also saw former jailbird and super model Naomi Campbell waiting to visit one of the stars (my guess is Juan Diego). Do you think she discovered opera behind bars? As we were leaving, we saw one our new favorites, Diana Damrau, who was hopefully taking notes for when she takes over for La Dessay in a couple of seasons. I can't think of anybody else who could fill the shoes of Natalie Dessay. What an awesome evening! And a bargain, too! I'd love to hear a little more about Marian Seldes' role. Pacey? From the Crick? Awesome! I just read an article in the N.Y. Times about the encore. Apparently, it was a very, very big deal. I had no idea. And you were there for it!